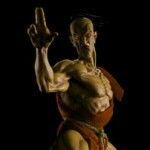 Pop Culture Shock has posted the detailed images for their upcoming Street Fighter 3 – Oro 1/4 Scale Statue. Pre-orders kick off Monday February 9th at 3:00 pm PST at PopCultureShockToys.com. The “Senjutsu” version will have 275 pieces, while the “Player 2″ version will have only 150 pieces available. Each will include a swap out head, a turtle, and will retail for $350 with a release due in the fourth quarter of 2015. In this weeks Pop Culture Shock newsletter, they revealed the finalized look, and some new info, for the Street Fighter 3 – Oro 1/4 Scale Statue. There will be two version, a player one and a player two version, both available exclusively through PopCultureShockToys.com. The standard “Player 1” version will be limited to 275 pieces, while the “Player 2” version will have only 150 pieces available. Each will include a swap out head, a turtle, and will retail for $350 with a release due in the fourth quarter of 2015. They announced that the Oro Statue will have a full reveal later today. We’ll update when those new images become available. Read on to check out the new pics. In the latest Pop Culture Shock Newsletter, they posted a few new previews. 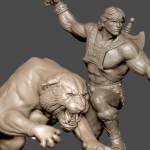 The first one is for a new He-Man and Battle Cat Diorama. That will be fully unveiled at WonderCon in April. 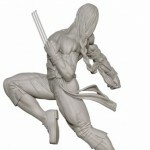 The other two previews showcase a few upcoming Street Fighter Statues. These include a look at the final approved design for Street Fighter IV’s Oro as well as an in-progress sculpt for a 1/3 scale Akuma Statue. Check out the new preview images by reading on. In this week’s Pop Culture Shock Newsletter, they previewed two upcoming Street Fighter Statues. The previews give us a glimpse at Oro from Street Fighter III and Street Fighter series regular Vega. No word on release date, scale or variations. Look for more info on these in the near future. Check out the images after the jump. Pop Culture Shock has released a teaser image for an upcoming Street Fighter 3 Oro 1/4 Scale Statue. 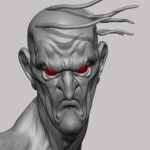 The sneak peek gives us a look at the in progress 3D sculpt. PCS has stated that this will be coming next year. We’ll have more info as it becomes available. Read on to see the teaser.